VATICAN CITY (CNS) — Married couples need more help in dealing with infertility and childlessness, which is “one of the major causes of divorce in Africa,” said a Nigerian member of the Synod of Bishops on the family. In a culture where “children are celebrated with all kinds of ceremonies” and are so important to society, the trauma that couples, especially women, experience, “is beyond anything I can say,” said Bishop Jude Arogundade of Ondo. “Everybody wants to leave a child behind,” he said. “If you don’t have a child and you die, it’s like you never lived,” he told Catholic News Service Oct. 15. 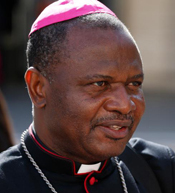 He said the increasing rate of infertility in Nigeria and other parts of Africa “is really alarming,” so he dedicated his brief presentation to the synod to this problem. The “complex process” involved with adoption means it is not typically an option for poorer couples, he said, and reproductive health treatments are usually not available. In a childless marriage, some men “become careless with their married life; they want to try something else,” which can lead to polygamy, adultery or “other abuses in married life,” he said. The women often “are traumatized, looking for God’s help, praying every day” to conceive a child, he said. Right now, in his diocese, “we create the environment” of community support by offering different prayer groups, programs, counseling and encouragement for these spouses. But even with the support of such a close-knit community, some women still feel inadequate or as if they have failed in their marriage, he said. A woman’s pain and sadness are more visible, he said, while the man, perhaps because “he wants to be strong,” seems to “deal with it” better. Some couples, in the end, just “give up, finding other means of finding happiness in life,” said Bishop Arogundade, who served 12 years at Our Lady of Mount Carmel parish in Elmsford, New York, before he was appointed in 2010 to lead the Diocese of Ondo. He said he made “kind of a little change” to his presentation after Pope Francis assured the assembly that the focus of their gathering was to offer needed pastoral care to people, not to change doctrine. “I must confess, people came with the idea that we are really going to fight to protect the doctrines of the church,” he said. He said his focus then became more pastoral as he looked at the actual situation the people were experiencing. The bishop said he was “glad this synod is giving us the opportunity to express, to voice out some of our concern” because talking through things helps people see new opportunities and new ways of dealing with the challenges. Fidelity to church doctrine remains paramount, “but in helping people who have different issues, we still feel that there is a way of reaching out to everyone, to bring them in, to create an environment of love and care and support for everyone,” he said. PREVIOUS: Extreme poverty declining but much work remains, says Vatican rep at U.N.